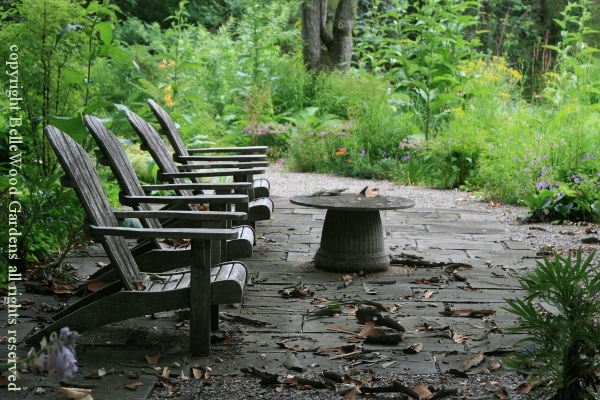 The majority of gardens available for visits through the Garden Conservancy's Open Days program tend to have their open days at the height of the season - late spring through summer, into September, with a scattering into October. 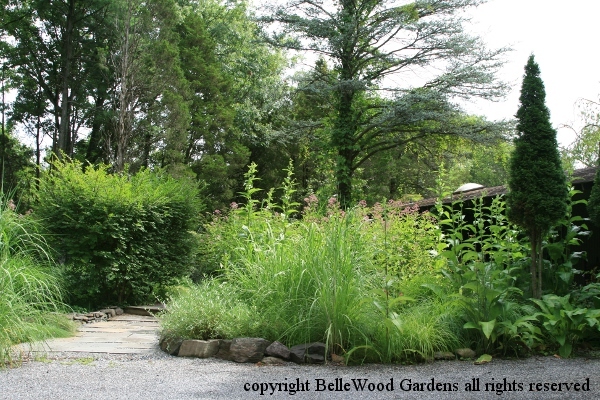 I was therefore quite intregued when I learned that the Garden at Federal Twist in Stockton, New Jersey would have its very first opening on 19 October 2013. Of course, I made sure to be there. Paging through the directory of gardens open in 2014 I made special note that this garden would again be open in October and in July. What a difference, from the green of mid-summer filled with flowers to a few months later in seedy fruitfulness and vivid autumn colors. 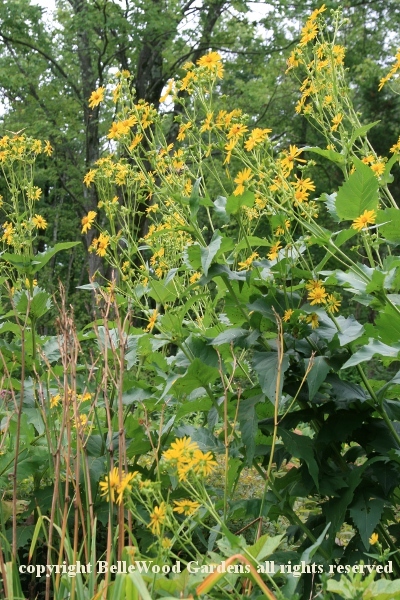 These are the stately plants of the North American prairies. I've been to the great grasslands of Missouri, Illinois, Minnesota. Grasses taller than a man on horseback. 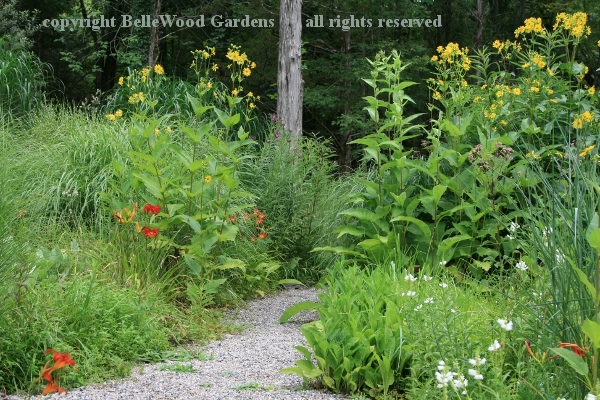 Some of the perennials have become well integrated into our gardens. 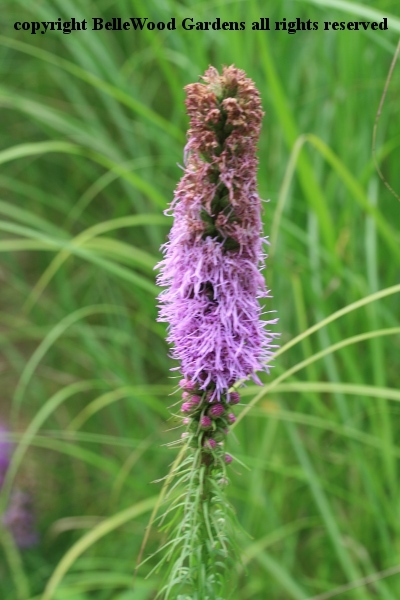 However they tend to be the midsized ones such as gayfeather, aka liatris. Not at the Garden at Federal Twist, where bigger is very much admired. Walking down the driveway. There's a house in there, somewhere . . . .
With lush exuberance the garden spills down the slope behind the house. Many grassland forbs are members of the Compositae, or daisy family. Yellow daisies, to boot. 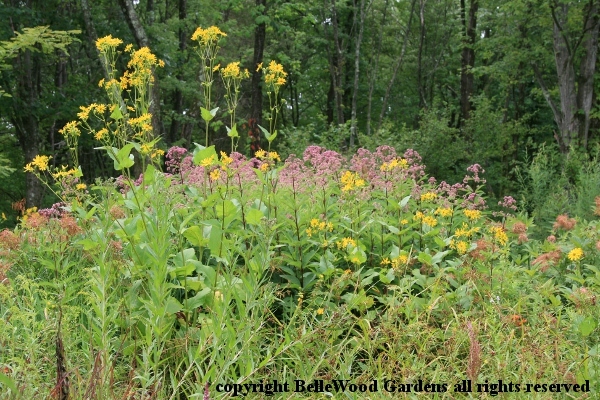 Since this is a garden, not a prairie restoration some non-native plants have been included in the palette. 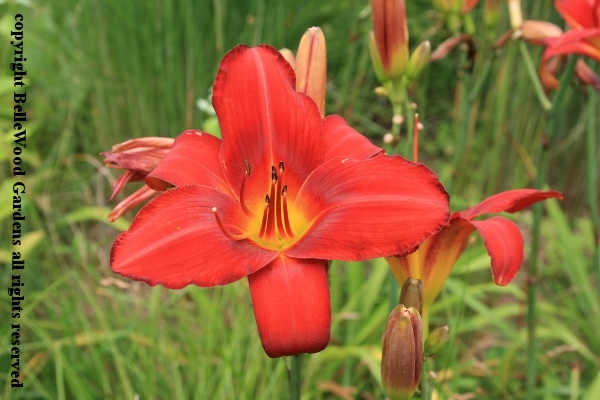 An array of vivid red daylilies, for example. Their flower shape is different, offering interesting contrast, while their colors fall within the same spectrum segment of the color wheel. 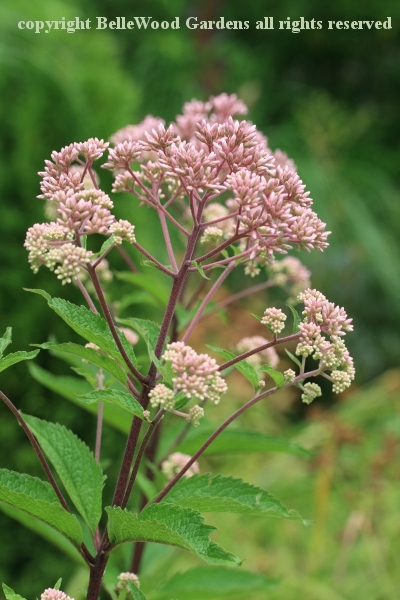 soft mauve Joe Pye Weed, Eupatorium fistulosum. 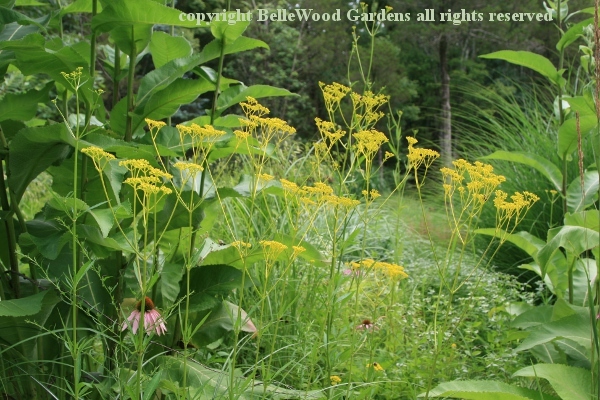 The silphiums are magnificent plants. As high as their self-supporting stems tower into the air, their anchoring roots delve even more deeply into the soil. 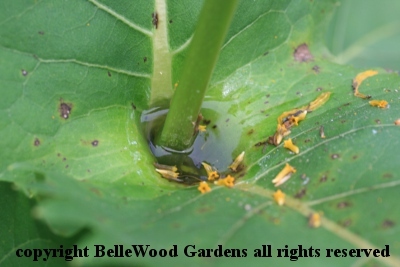 Cup plant, Silphium perfoliatum, has leaves that clasp around the stem. So tightly do they join that a small water-holding cup is formed at which small birds can have a drink. 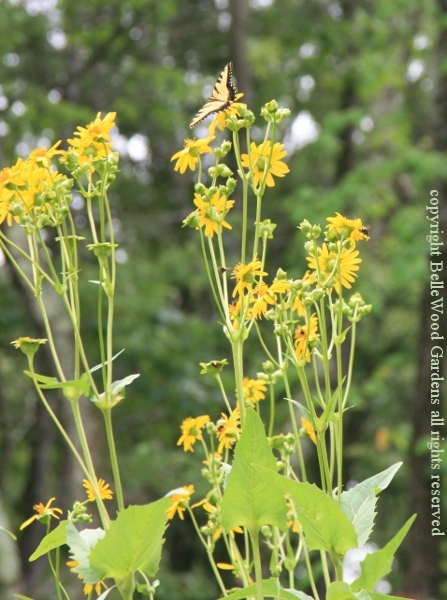 Tall enough that in their native habitats the flowering stems are waving up above towering prairie grasses, advertising to the passing pollinators that here are worthwhile landing pads, with nectar and pollen available. The equivalent, for a butterfly, to McDonald's golden arches. Other stately yellow daisies abound, such as Rudbeckia maxima. A softer texture is provided by Patrina scabiosifolia in the Valerian family. rather than from the bottom up like more sensible foxglove. Ironweed, Vernonia. Butterflies love it. 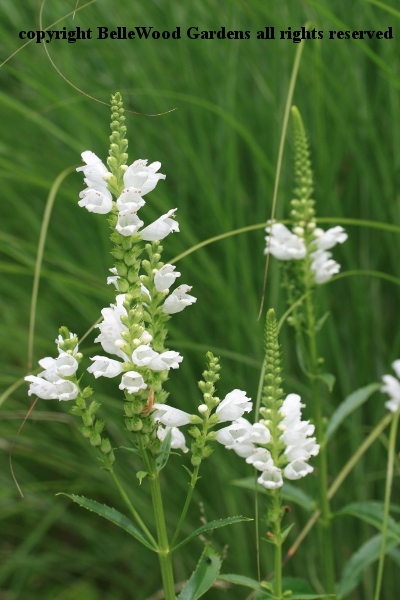 Grows in sunny, damp to wet sites. 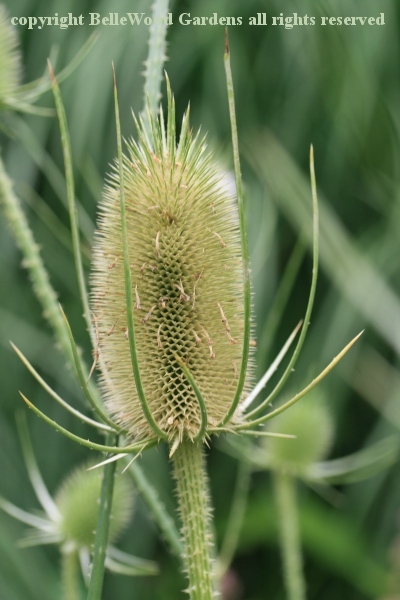 The prickly heads of teasle were once used to "full" or raise the nap of woolen cloth. 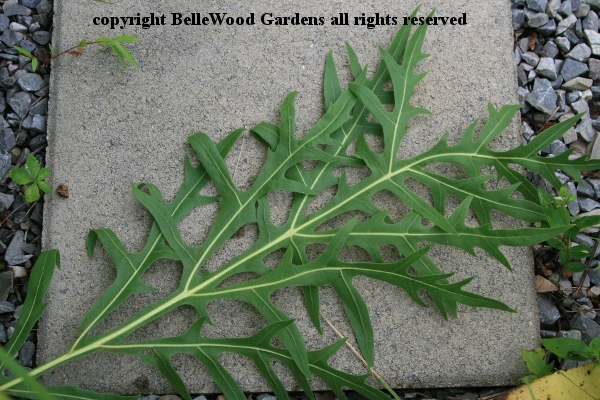 Today more often considered a weed, this biennial was cultivated, carefully harvested, divided into the largest "king" teasle, smaller "queen", and smallest "buttons." Bees love to gather teasle nectar, and the resulting honey is said to be delicious. 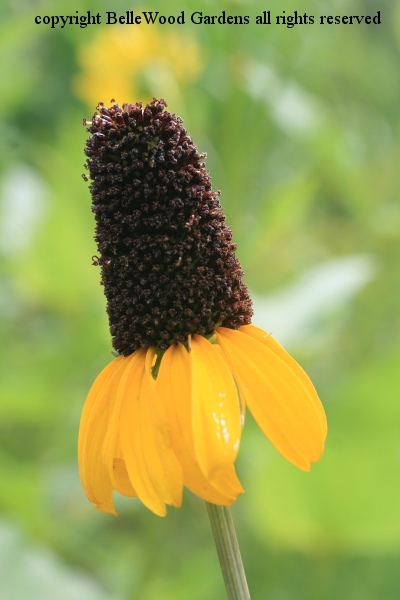 you can push the flowers to one side or another of the stalk, where they will stay. Heading off into the silky tuft of grasses. 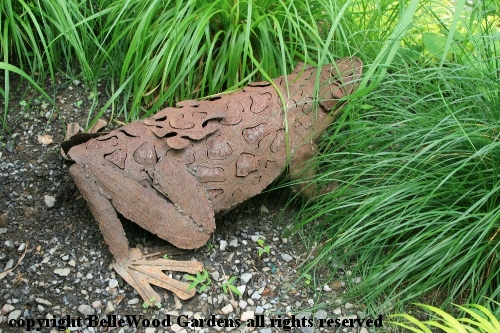 Frog, or toad? I'm not sure. 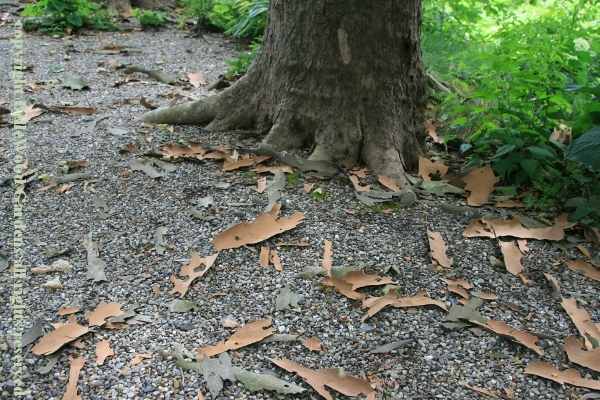 Sycamore branches are swelling, popping off flakes of bark. at home in the Garden at Federal Twist. Saturday, 18 October 2014. See you there.